Did you know you’re OVER PAYING your taxes by having a job instead of a business? The SINGLE best thing you can do to KEEP more of your money is to IMMEDIATELY start a home business. 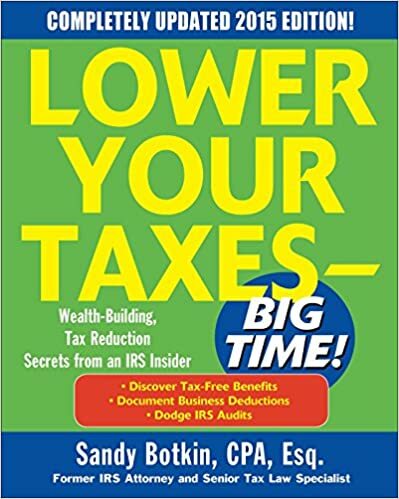 I was fortunate to see Sandy Botkin, author of “Lower Your Taxes” at a business conference back in 2011. Unlike the “stereotype” of the “typical” I.R.S. agent, he’s extremely entertaining and informative. Be sure to check out his website — www.SandyBotkin.com . Now is the best time to start a home-based business. I’m NOT a tax professional. But, I do work with some! 2) Start your home business for just $25 and test-drive us for 30 days. 3) And be sure to leave your comments below! Thank you, again, for visiting the blog! Stay tuned “tomorrow” for The Top 10 Ways Your Job Is Costing You Big Time! Can’t Shake It Off! Even Police Officers Love Taylor Swift! Awesome, Mey!!! That was my personal experience, as well. Congratulations to you for making the time to figure out “the rules of the game.” This “game” is available for all Americans. However, far too many know more about Hollywood celebrities than 10 ways to retire in the next 10 months! Next story Top 5 Ways Your Job Is Costing You 5-Figures!